There are no academic entrance requirements to our program. As one of our founders often said, “we want anyone to feel welcome to come and study with us.” Many of our students are members of churches of Christ, but not all. We invite anyone, from any walk of life or religious background, to become a part of our large and diverse student body. Just bring your Bible, a notepad, and a desire to study, learn, and grow. Our instructors are, themselves, lifelong students of The Word. They bring to the classroom an unwavering dedication to a sound, thorough hermeneutic and exegesis of Scripture. GSOP instructors are, above all, faithful Christians – each with a distinguished tenure of service in ministry, and are academically qualified to instruct at the college level. 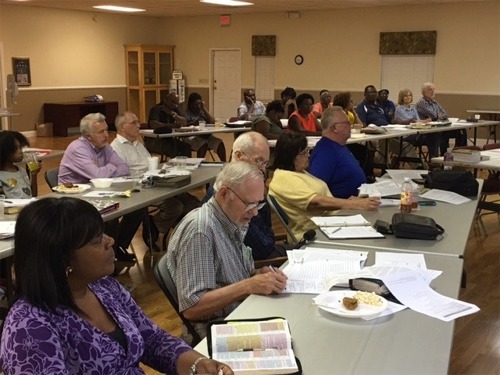 They possess earned degrees from accredited academic institutions, as well as multiple years of experience in local church work, evangelism, missions, counseling, and related disciplines. Our curriculum is a comprehensive, balanced, thirty-six (36) hour program of study which may be completed in as few as six consecutive quarters (two calendar years). Though class sizes vary, all courses involve close interaction between instructor and student. Independent Study courses are also available on an, “as-needed,” basis. Students have the option to take courses for credit or audit, while pursuing a path of study toward earning one of two certificates upon graduation. GSOP course credit is transferable to select schools of preaching and undergraduate institutions affiliated with churches of Christ. Please…Come take a course, and bring a friend!